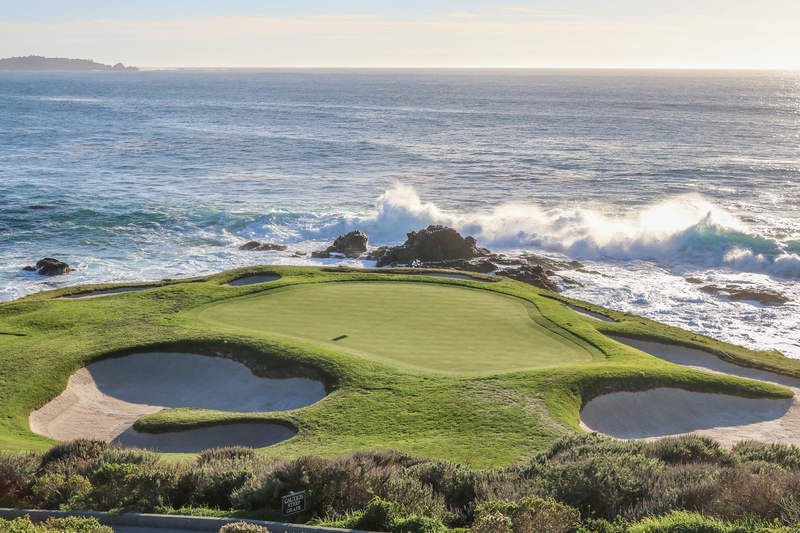 These moments in your round at Pebble Beach are some the most anticipated in all of golf – standing on the seventh tee, gazing across the giant chasm on No. 8 and sizing up your tee shot on No. 18 – but they are as perilous as they are picturesque. 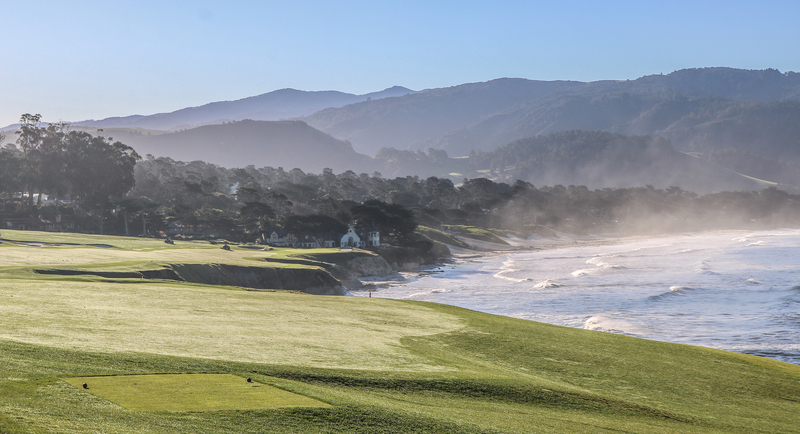 Pebble Beach Golf Academy Director of Instruction Laird Small takes you inside these shots, and shares some comforting tips. Learn more great tips like these in Laird’s book, “Play Golf the Pebble Beach Way,” which is available at the Pebble Beach Golf Academy. Call 831-622-8250 for more information. When you step onto the 17th tee, you are bound to think about Jack Nicklaus’ perfect 1-iron that struck the pin at the 1972 U.S. Open, and Tom Watson’s clutch chip-in to seal the 1982 U.S. Open. But you are far more likely to see a long bunker shot from the wandering sand that protects the hourglass-shaped green. From the back of the bunker, it’s a 35-yard carry to the green. If you are faced with this shot, keep in mind that if you hit a full sand wedge 75 yards, the longest you should try to carry a bunker shot with that club is 25 yards. (A good rule of thumb: the farthest you should try to splash a bunker shot is one-third the distance you hit that club.) So take your same 10 to 2 o’clock bunker shot swing, but club down to a pitching wedge or 9-iron for that 35-yard shot. When you play out to Carmel Beach for the first 10 holes at Pebble Beach, the land is falling off to the right of you and toward the ocean. The most severe case of this is No. 10. That downhill slope wants to make your ball work toward the trouble you are trying to avoid. For a right-hander, that means your natural shot will fade. It helps to take an extra club – it’s difficult to hit the ball perfectly from a sidehill lie, and that extra club helps you swing more balanced. The shot tends to move toward the bottom of the slope you are standing on. For your approach on No. 10, aim at the left greenside bunker, and let your shot work off it and toward the middle of the green. Sitting at the tip of Arrowhead Point, the wind can howl from just about any direction when you reach the seventh hole. But it commonly blows off the ocean from right-to-left, which means that to hit the green, you sometimes have to aim over the ocean, and trust that the wind will bring it back. A right-to-left wind, coupled with our tendency to aim left on downhill shots, means the left greenside bunker on No. 7 is very popular. So how should you hit this precise shot? Recognize that the shot plays uphill. Add 15 yards to account for it. If you’re feeling dialed in, take dead aim. Looking for a contingency plan? Long and to the right is relatively flat, and sets up the best recovery angle. Avoid short and left to take those big numbers out of play. 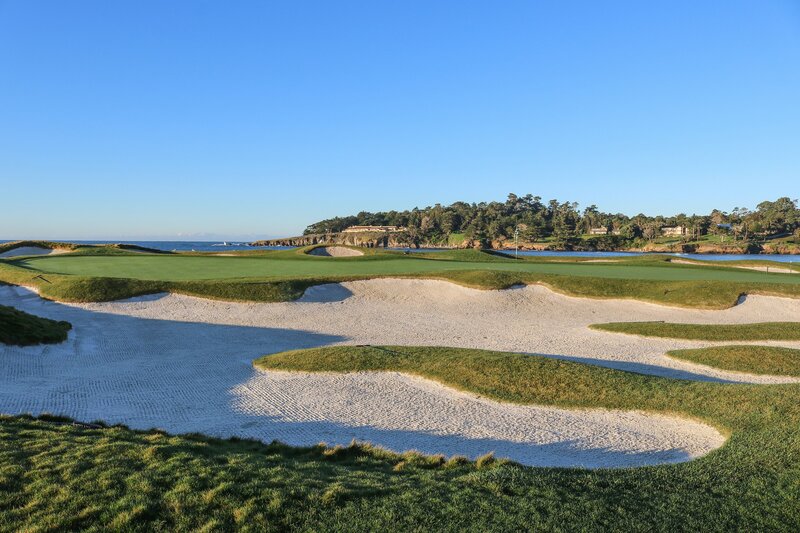 The most interesting aspect of the 18th at Pebble Beach is that it is actually a succession of challenging holes. It’s a great and endlessly beautiful par-5 as is, of course. But after a solid drive up the middle it becomes the equivalent of a terrific short par-4. It’s a fascinating birdie-three hole from, say, 330 yards out. And it’s a thought-provoking birdie-two hole from 130. Which is exactly what every strategically sound par-5 should be. Let’s focus on that par-3 hole from 130. If you’ve aggressively challenged the bunker along the seawall and hit your layup to the left side of the fairway, you’ve created the best angle for your third shot – looking straight up the green, with bunkers flanking either side of it. 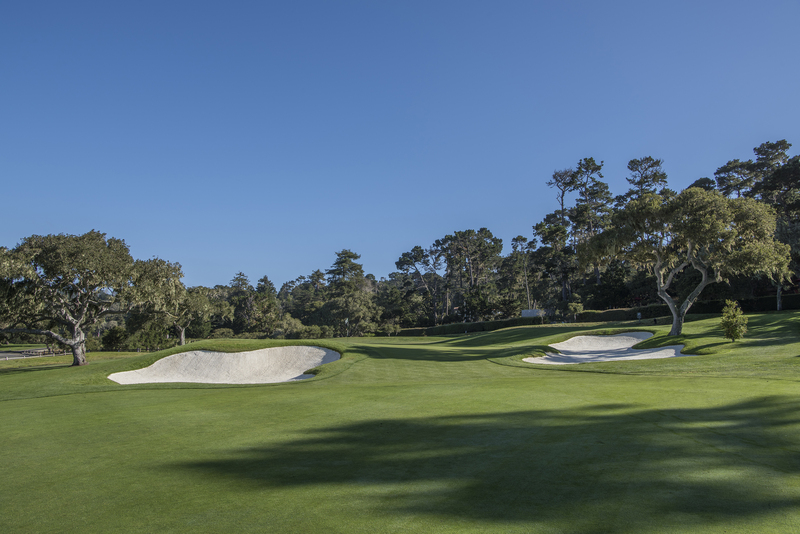 If you lay up right, not only do you have to carry the right greenside bunker, but you also have to miss the towering Monterey Cypress. Miss it too far left, though, and the ocean lurks. Remember that the third shot plays uphill, and be mindful of the wind. The flags atop The Lodge are a helpful gauge. Want to perfect these shots at Pebble Beach? 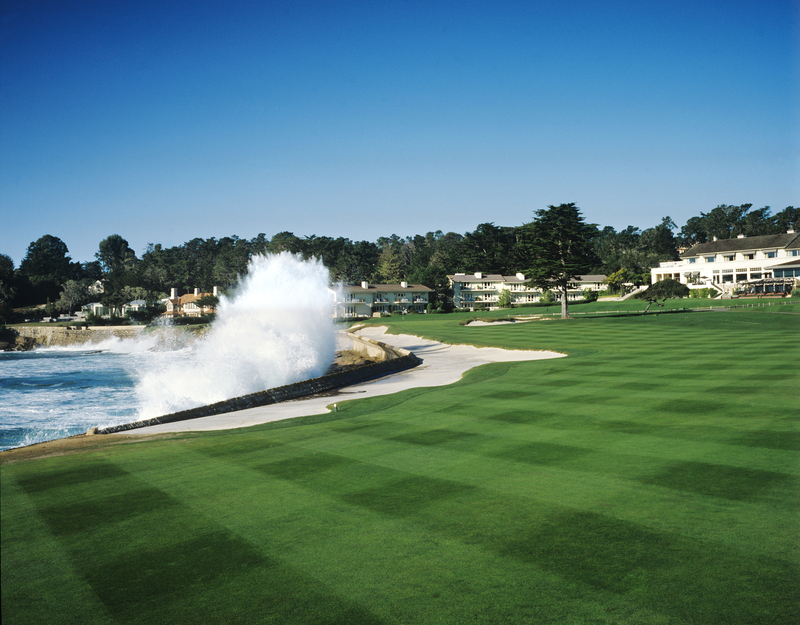 Learn more about Golf Schools at the Pebble Beach Golf Academy.